Avinash Treebhoowon was cross-examined by the prosecution today as the trial of the two men accused of murdering the Tyrone woman continued in Mauritius. Avinash Treebhoowoon at the Supreme Court in Port Louis, Mauritius earlier this month. The trial is now in its fourth week. ONE OF THE two men accused of murdering Michaela McAreavy was unable to explain why doctors examining him after his alleged torture by police reported no external injuries to his body. 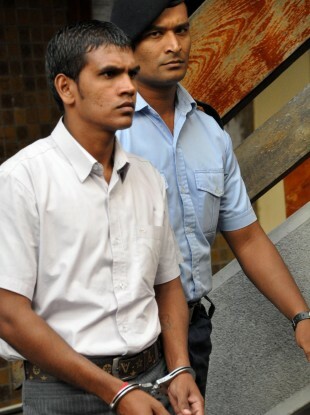 In the witness box for the third consecutive day, the former Legends hotel room attendant, Avinash Treebhoowon, was cross-examined by State Counsel Mehdi Manrakhan. Treebhoowon and another hotel worker, Sandeep Moonea, both plead not guilty to the charge of murdering the Tyrone woman who was on honeymoon with her husband John McAreavey in the hotel in the north of Mauritius in January of last year when she died. The prosecutor, who said Treebhoowon was “drowning in lies” yesterday, maintained this line of attack today as he stated to the court that he found it dubious that the accused had not found it important to give a statement either in court or to the police about the alleged torture eighteen months after his initial arrest by police in January 2011. The former room attendant replied he was traumatised and feared the threats being made to him by police officers. He said he described these events to his counsel when he had the first opportunity to have a private meeting with them. Manrakhan asked why the doctor who examined the accused after his appearance in court at Mapou on 12 January 2011 made no mention of external injuries which Treebhoowoon has said he received. Judge Prithiviraj Fekna also asked Treebhoowon why there was no mark on his face where he had claimed he had received thirteen different marks, according to the count of the judge. To both questions the accused said he could not explain. The leading State counsel also read out the statement the accused gave on the 13 January 2011 but later claimed he had not given. Manrakhan read the statement to him with Treebhoowon agreeing with most of the evidence quoted regarding events that happened on the 10 January up until the point where Michaela McAreavey was killed. The counsel said if he does agree then “he must have given the statement as police officers would not know so many details”. The accused replied that these events were correct because he had told the police about them on 11 January. However, the diary entry of the Major Crime Investigation Unit do not bear so much details, argued Manrakhan. Treebhoowon maintained his version and denied the rest of the statement which says that he confessed to having killed the Irish tourist with the help of his supervisor, Sandeep Moonea. He said he only signed the document and at no point in time did he say a word of what was in it. Manrakhan ended his cross-examination by stating once again that Treebhoowon “was lying” and “that he had never been subject to police brutality”. He told the court that the accused “gave his statement voluntarily assisted by his counsel” but the accused strongly denied these statements. Email “Michaela murder trial: Accused labelled 'a liar' by prosecution in case ”. Feedback on “Michaela murder trial: Accused labelled 'a liar' by prosecution in case ”.